Shane Bouher and Ashley Simpson both scored hat-tricks as Abington hit the goal trail with a crushing 10-3 win over Bat & Wickets in the Championship. Also on target were Calvin Budd, Sam Lapite, Jordan Timson and Richard Carr, with Dean Gudgeon, Jack Grant and Aaron Frisby scoring Bat’s consolations. Luke Gilsenan also hit a hat-trick for Halse United as they claimed a 6-3 win over FC Obelisk, with their other goals netted by Neil Fotheringham, Adam Hilton and Jack Purnell. Graeme Ahearn scored two and Luke Freestone one for Obelisk. Spartak FC were 4-2 winners at Parklands Phoenix thanks to strikes from Matt Philips, Adam Norton and Sam Leighton (2), with Stuart Harman and Dan Scott replying. The Gardeners Arms had a field day as they thumped Kettering Ise Lodge 7-0 with goals coming from Aaron Hinds (2), Aaron Shane, Jordan Stewart, Michael Cromey, Charlie Merrey and Adam Quigley. 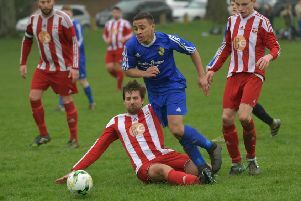 The other game in the division saw Jack Wright and Tobi Lawal notch for Wootton Field Wanderers, but it wasn’t enough as AFC Trinity eased to a 5-0 success with Daniel Smith, Dean Wilkinson, Kenny Hawker (2) and Benji Graham on target. Premier League leaders Queens Park claimed another three points as they saw off AFC Houghton Magna 3-1 thanks to goals from Dean Hall, Jonathan Shakespeare and Lee McConnell, with Chris Dickens getting one back. Ryan Brown had his shooting boots on as he rattled in four for Harpole as they thrashed AFC Brampton 9-2. Harpole’s tally was completed by goals from Ashley Ogden, Luke Tolworthy, Wayne Richardson, Ian Waldock and an own goal, while Jaques Reid netted both of Brampton’s consolations. In the cups, Hartwell Forest progressed in the NTFA Chronicle & Echo Cup as they saw off Spartak Reserves 3-1. Marc Thorp scored a double and there was one for Joe Sames, with Aaron Crampton replying. Northampton Sovereigns are out though, as they lost 2-1 to Hardingstone Sun despite an effort from Mariusz Suszynski. Norteles enjoyed a 3-2 win over Denton in the NTFA Goodliff Cup with Sebastian Thompson (2) and Montel Dore the men on the mark, seeing off strikes from Callum Snooks and William Cantrell. In the Dave Ferguson Trophy there was a big win for Dallington Falcons, who buried Sixfields Rangers Reserves 9-2. Rhys Redding led the way with four goals, there was two for Alfie Malin and singles for Richard Novak, Alex Mbayo and Sam Howe. Sixfields’ scorers were Layton Goodwin and Jake Varley. There was a seven-goal thriller in the Alan Dimmer Trophy, with JA Global pipping Northampton Sapphires 4-3. On target for the winners were Scott Ramsay (2) Lawrence Bulliman and Craig Ball, with Lynden James Efde, Gavin Vella and Sean Calcutt replying. Calum Hope notched the only goal as Nomads of Barratts edged past Abington Stanley 1-0, while another close game saw West Haddon Albion beat Real Roochers 2-1. Wesley Lothian scored for Roochers , but Robert Pugh and Karl Shingler won it.